Andreessen Horowitz-backed music lyrics and annotations Rap Genius was the latest to stray over to the darker side of so-called “growth hacking,” with its spammy SEO tactics disguised as an affiliate program. Called out, exposed and now punished by Google, the site’s traffic has tanked. But Rap Genius, thanks in part to that $15 million investment, will probably recover. They’ll clean up their links, make amends, and maybe even get back into Google’s good graces. End users will once again land on Rap Genius’s pages, many of them none the wiser for the time the site spent in the penalty box. Other startups may not be as lucky. It’s one thing to tempt fate by breaking Google’s rules, it’s quite another to risk alienating a service’s potential end users themselves. And yet, this is today becoming far too common, especially with mobile applications. Due to the App Store’s nearly impossible to break into Top Charts, app makers have to manufacture and force growth to attract their initial users, and kick off those “viral” effects. We’ve seen this in the past with Path (which burned its users multiple times), and also earlier this year with Glide’s over-eager invitation system, to name a couple of the more high-profile incidents. 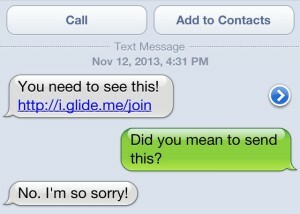 Glide’s variation on the SMS spam was especially ugly, because its messages weren’t “try this app,” but things like “you need to see this! <link>” – more of a deliberate attempt to trick users into downloads. Glide later promised it would stop “spamming” users, but a quick look through Twitter indicates that’s not quite the case. Spam, you see, is in the eye of the beholder. If it’s an unwanted invitation, well, it’s spam. And if it’s an invitation you didn’t mean to send – even if the app lets you “opt out” – well, that’s spam, too. There are several things that make the app at least appear like it’s been attempting to “growth hack” (overly quickly grow) its user base. The company said a couple of weeks ago that it had 10 million users and is growing at 1 million news users per month, and on Android, it’s listed as having 5 to 10 million installs, which pointed to the possibility that Android, which has fewer restrictions around inorganic and bot-driven growth, is its source of most installs. Circle says that’s wrong though – its user base is more even at only 55% Android, 45% iOS. The Android app also has the same number of reviews as Snapchat, an app 10 times its size. Many of these have the characteristics of “bought” reviews, given they’re one-liner, five-stars, in rapid succession. Again, Circle CEO Evan Reas says that’s definitely not due to Circle buying users – “we have never done that,” he claims. And finally, the app also ranks highly in countries like Niger and Kenya, or more recently, Mozambique and Mongolia, which seems odd. Reas can’t explain this beyond guessing that maybe Circle was featured in the country’s app store. But whether or not Circle was growth hacking through less than above-board means is almost beside the point, no matter what Valleywag claims. The problem was that one of the company’s “experiments” – the term Reas prefers over the more ambiguous “growth hacks” – backfired. The company abused SMS invitations – maybe an idea Reas picked up from Tinder? Circle had always allowed users to say “yes” or “no” to sending out its invitations, Reas says, but previously it had allowed users to invite people as many times as they wanted. That meant users could invite friends a dozen times, if they chose to do so. And with so many app users not really understanding or carefully reading user interface components around the invitation process, users were soon massively spamming their friends to join Circle. This all occurred at once, too, after an update was pushed out and promoted, making the issue seemed even worse than it would otherwise. While I’ve confirmed the company never violated Twilio’s terms of service, they were certainly operating in a gray area of what’s socially acceptable. “We found that with SMS invites, that quickly became annoying,” says Reas, which seems like quite the understatement given the above user reaction. “You need to grow by having a great user experience,” Reas says. “Don’t just grow for the sake of growing…and make sure that the way you’re growing not at all taking away from the great user experience,” he advises other entrepreneurs, while assuring us that Circle has always been focused on the latter, despite the mistakes it made. Of course, the pursuit of viral growth is not a new thing – many of the best companies have worked to improve user engagement, user growth and search rankings, for years. But today’s startups are sometimes walking a fine line between this so-called “growth hacking,” and just plain ol’ hacking, consequences be damned. Or at least, consequences as risks companies are willing to take in an effort to raise funding, meet investors’ expectations, or simply grow the business at a faster-than-natural clip. But growth at all costs is a gamble, and sometimes you’ll lose. Rap Genius lost – at least in the short-term, though it may recover over time. However, those gambling with their users’ trust are attempting the riskiest move of all. Once bitten, twice shy users don’t need to give a company another chance when the App Store has over a million apps to choose from. You’re always just a tap away from deletion, and you could very well growth hack your way right out of business if you’re not careful. What’s worse is the more these companies play fast and loose with users’ trust, the less likely users will be to give others – including those playing by the rules – a fair shot in the future. That in turn will make it even harder for apps to grow their user bases, and will force them to again turn to more aggressive tactics as the cycle repeats.